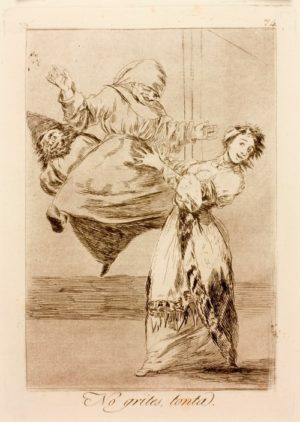 Los Caprichos is a series of satirical etchings. The first edition of 1797 consisted of 72 etchings and the final edition of 1799 consisted of 80 etchings.Although the exact subject of this print remains unclear, a number of interpretations revolve around tales of lustful monks calling on women of status. This interpretation appears to be supported by the notable difference in the original sketch for this print in the Museo del Prado, Madrid, where Francesca’s expression is one of fear, while in the final print she smiles coyly.